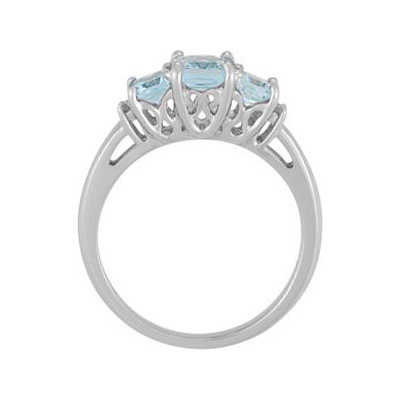 Three genuine emerald-cut aquamarine gemstones are set in this beautifully feminine three stone aquamarine ring from Apples of Gold Jewelry. Four round full-cut accent diamonds also adorn the ring - two on each side the outer gems for a total of 0.05 carats of authentic white diamonds. 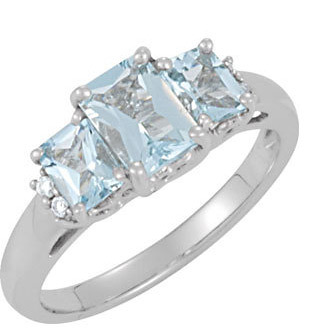 Center aquamarine gemstone is a large 7mm x 5mm gem weighing 0.85 carats flanked by 5mm x 4mm aquamarine on each side with a carat weight of 0.16 carats each, making this a spectacular grey-blue 1.17 carat gemstone ring crafted in real 14k solid white gold. The ring is available in sizes 5-8 for women, including half sizes. We guarantee our 1.17 Carat Three-Stone Emerald-Cut Aquamarine Ring, 14K White Gold to be high quality, authentic jewelry, as described above.